My friend Paul recommended this. "It's gripping and quite short. You need to catch up on your reading, don't you?" He was right on all fronts. Mohsin Hamid is a journalist and writer based in London. He was originally born in Pakistan, but studied and worked in the USA. You sense that his experience of straddling life in two different countries informs this powerful portrayal of clash of cultures. 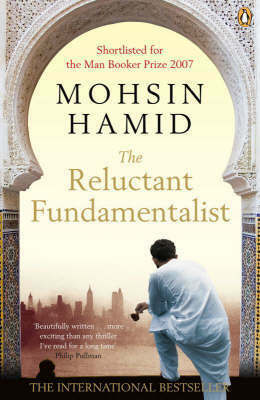 The Reluctant Fundamentalist is about a chance meeting between an unidentified westerner and an anonymous local in a Lahore cafe. What follows is the real-time unravelling of a tense game of cat and mouse. Gradually, the local befriends the visitor, teasing out - through adroit questioning - certain details, so you realise all is not what you think. As you learn about this man's life; his experience at college in America; his life, love and losses; the tension creeps up on you as it becomes clear that all is not what it seems. The background of the market contrasts the unfolding scene. During the day it's cacophonous and loud. You will it to be quiet so as not to distract from the conversational skirmish that is unfolding. But as day turns to night, the stalls pack up. A new crowd of shadowy figures creep into the darkening street. You long again for the noise and distraction to dissipate the almost unbearable tension. I was gripped to the very end. This is a masterpiece. Read it.